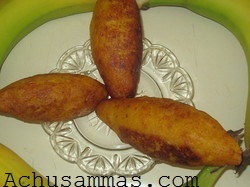 · Steam the banana till soft allow it to cool. · When it became cool, skin off n\and removes the black seed, mash it with hand. 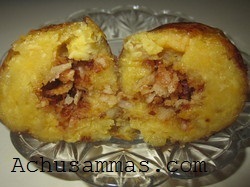 Make a medium size banana balls. 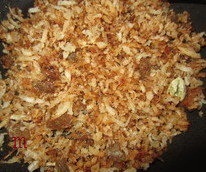 · In a pan add ghee and sauté coconut, cashews and raisins till coconut becomes slightly brown in color. Add the sugar, cardamom powder and mix well remove from heat. 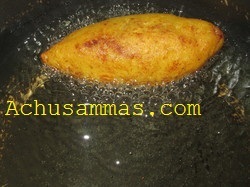 · Grease hands with little oil and place the banana ball into the palm and flatten it with finger. · Repeat the process with the remaining banana. 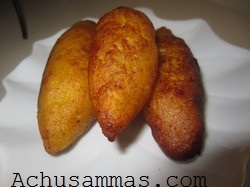 Super delicious snacks..feel like having it.. I have never come across this banana preparation..interesting. 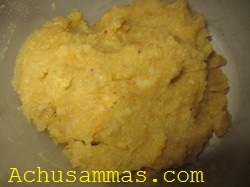 will come back leisurely to see all ur recipes. what a delicious recipe, my kids will love this. Super tempting snack !! looks delicious !! Wow, you make so many dishes from bananas, this looks so delicious..
What a lovely combo of ingredients of these yummy snack! 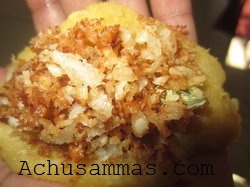 Very lovely stuffing delicious snacks. A different kind of banana fritter. Never heard nor seen this before, but I definitely love everything in it! Banana, coconut, cashews - wow...that is something I should try! Yummy, this looks great, very inviting..
Yummy snack, looks so tempting.